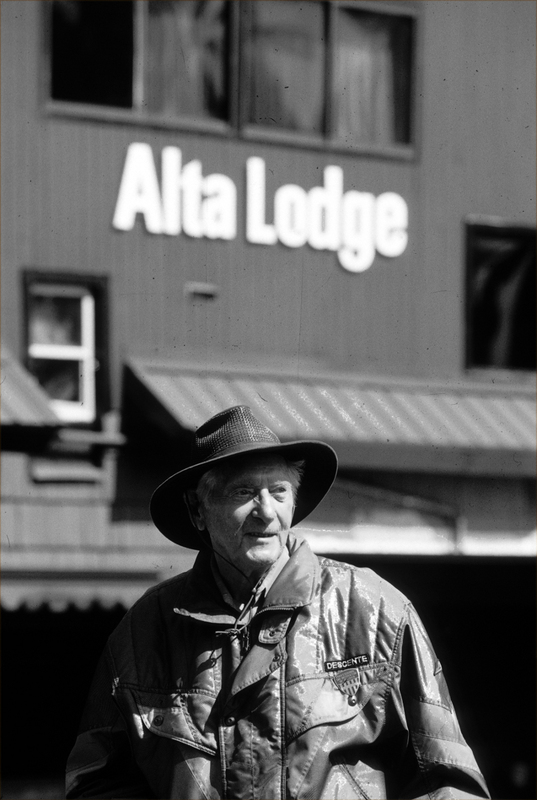 William Haskell (Bill) Levitt, long-time mayor of Alta, Utah, and owner of the Alta Lodge, died on Dec. 29, 2009. Mr. Levitt was a graduate of the University of North Carolina, holding B. A. and M. A. Degrees in Sociology and Human Geography. Over a long and varied career, before moving to Alta in 1956, Mr. Levitt served as Director of Housing Surveys for the State Planning Board of North Carolina; was a principal Agricultural Economist in the U. S. Department of Agriculture; served as International Education Director for the UAW/CIO; was a sergeant in the U. S. Army in World War II; was a film maker, producer/director for Film Documents; and studied at the Art Students’ League in New York City. During his 34 years as mayor of Alta, Mr. Levitt, at various times, was President of the Utah League of Cities & Towns; Chairman of the Governor’s Council on Community Affairs; Chairman of the Wasatch Front Regional Council; President of the Salt Lake Council of Governments; member of the Governor’s Wilderness Committee; Municipal Representative on the State Air Quality Board; Chair of the Public Safety Committee of the Salt Lake Council of Governments. He served as President of the Utah Ski Association and was a retired member of the Intermountain Ski Instructors Association. He was also instrumental in the creation of Friends of Alta. Mr. Levitt was born on Feb. 18, 1917, in Brooklyn, N. Y., a son of Samuel Levitt and May Kane Levitt. He is survived by his wife, Mimi Muray Levitt, to whom he was married on Dec. 17, 1982; a sister-in-law, Katherine Levitt, Savannah, GA; three sons, John, San Francisco, CA; Bino, (Marty Jones), Haiku, HI; Toby (Heather), Salt Lake City; a daughter, Cassia (Marcus) Dippo, Salt Lake City; a daughter-in-law, Victoria Levitt, Potsdam, NY; seven grandchildren, Ethan Levitt (Meggan), Atlanta, GA; Elissa Levitt, Houston, TX; Sam and Wilson Dippo, Salt Lake City; Sara, Matthew, and Hanna Levitt, Salt Lake City; a great-granddaughter, Maggie Levitt, Atlanta, GA. He was predeceased by a son, James; a sister, Helen; and a brother, Robert. A marriage to Elizabeth Ayscue ended in divorce. A marriage to Janice Loeb ended in divorce. Bill Levitt was a humanitarian and cared about people as well as about Alta’s history and its future. He was unusually talented, energetic and charismatic, but more than that, he used his powers for the greater good. He was a liberal in the truest sense of the word. His priority was never his own enrichment; it was always community, nature, open spaces and people. Bill fought for what was important to him; his principles, Alta, its community, its people and its future. He was always looking to the future. Bill never seemed to care what people thought of him, but he cared deeply about people themselves—whether they were “important” in the conventional sense or not. Bill had a great life and he was still in possession of his powers at the end—funny, intelligent, and full of idealism and spirit. A private service will be held at the convenience of the family. A memorial service is also being planned for sometime later in the spring. In lieu of flowers, contributions may be sent to Friends of Alta, P. O. Box 8126, Alta, UT 84092.